AMSTERDAM — Let’s get one thing out of the way first: everything has already been said and written about Zwarte Piet. It should require no explanation anymore that there are people who say that they are pained and insulted at the sight of this black-faced character that accompanies Sinterklaas. And that in any normal society, any normal person would cease whatever they are doing that causes pain and insult. Zwarte Piet is a character in the annual festivities headlined by Sinterklaas, a bearded do-gooder who brings children toys and candy in early December. While many people insist that the black-faced character is an innocent part of Dutch folklore, opponents decry him as a painful racist stereotype; he is portrayed with thick black curly hair, thick accentuated red lips and hoop earrings, much like enslaved Africans would supposedly look a few centuries back. That he is often played by white people with their faces blackened, his speech is heavily accentuated and almost unintelligible, while he does funny caprioles to entertain his master and his guests, is clearly a prejudiced stereotype of black people, the opponents say. In these video’s foreigners give their opinion on Zwarte Piet. Hoe denken buitenlanders over zwarte piet? The arrival of the Sint has for years now been preluded by heated debate about whether Zwarte Piet should be made less racist and even relegated to the past. 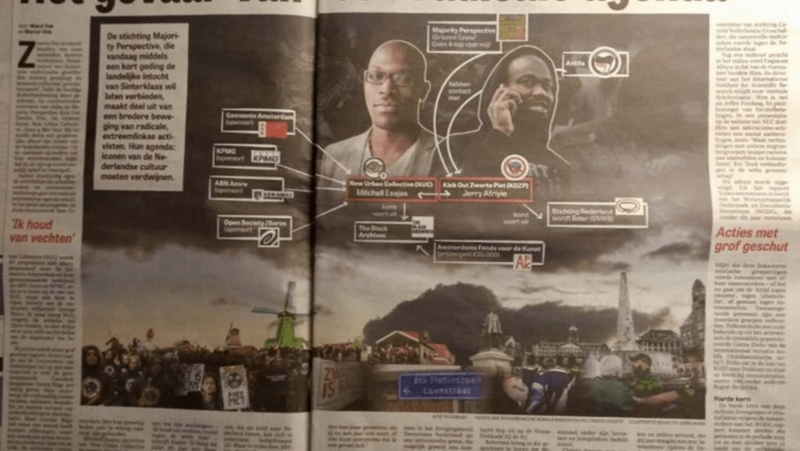 While fighting over the issue had a particularly nasty tone where even the country’s top politicians were forced to comment, anti-Zwarte Piet activists have endured this behaviour for years. This year it came to clashes between protestors and counter-protestors, on Saturday November 17. NLTimes reported of a weekend that saw anti-Zwarte Piet demonstrators attacked by threats, racist epithets, and with eggs and beer cans hurled at them, during the Sinterklaas arrival events in the cities of Eindhoven, Groningen, and Leeuwarden, while threats of violence forced the cancellation of a protest in Nijmegen. Dozens were arrested, among them people who police referred to as “a group of football hooligans that sought out confrontation with demonstrators from activist group Kick Out Zwarte Piet.” Some openly chanted “sieg-heil” and were photographed performing the Nazi salute, extending the right arm from the neck into the air with a straightened hand. The fact that neo-Nazi’s had joined counter-protestors to “welcome” activists to their cities during last weekend’s Sinterklaas parades and pelt eggs and hurl insults at them, is also worrisome. That there has been no outcry of disgust over this, speaks volumes. It shows that the issue of Zwarte Piet goes beyond racism and preservation of Dutch folklore; it is about power. About a marginalized group complaining about being marginalized and a dominant group not willing to budge. That is the story a self-respecting journalist would tell. That there is still debate about this, after so many years of complaints, demonstrations, petitions and court cases, is certainly cause for concern. But this piece is not about that; after all, all has already been said and written about Zwarte Piet. It gets truly worrisome however when journalists and entire media-outlets openly choose a side and lend themselves to exacerbate any pain and insult. 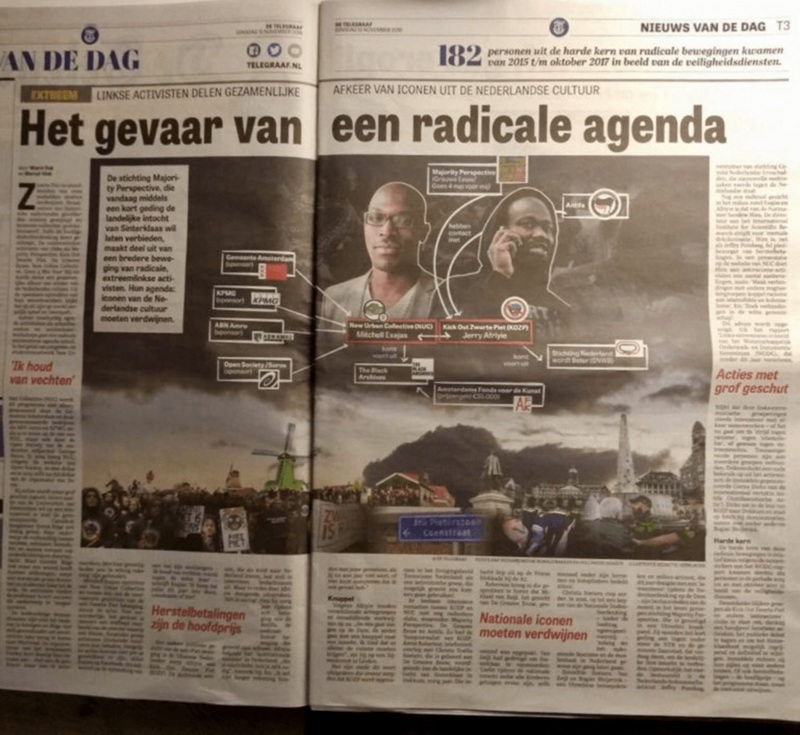 Last week we saw Telegraaf newspaper dedicate a two-page spread (right) in its Tuesday November 13 edition, to paint Zwarte Piet protesters Mitchell Esajas and Jerry Afriyie as sinister radical leftist terrorists who are out to destroy Dutch culture. 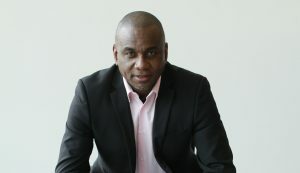 A few weeks ago, popular current events TV show “RTL Late Night” placed Afriyie in the audience, because counter- protester Jenny Douwes refused to sit with him at the host’s table; Afriyie and Douwes were at the time at opposing ends of a criminal trial in which she was the accused (and subsequent convict) and he was one of the victims of a violent highway blockade and attack that she orchestrated in November 2017. Both had been invited to share their views in the talk show, but when Douwes said at the eleventh hour that she would not join Afriyie at the table, the talk show relegated him to “the back of the bus.” This created a situation of inequality, in which the accuser was granted more time to state her case to the TV programme’s audience than the activist whose right to demonstrate she had violated. Afgelopen vrijdag zaten dichter en mensenrechtenactivist Jerry Afriyie en Jenny D., een van de verdachten in de strafzaak tegen de zogenaamde blokkeerfriezen, (uiteindelijk allebei) aan tafel bij RTL Late Night met Twan Huys. Wat bedoeld was als een gelijkwaardig gesprek tussen twee partijen in de zwartenpietendiscussie, ontaardde in een vertoning van hooghartige arrogantie en wit privilege.In de nabesprekingen op social media en in de kranten gaat het vooral over de verbroken afspraken die tijdens de uitzending aan het licht kwamen. Maar er was meer mis met de uitzending. Bekijk in dit filmpje wat er gebeurde en vergeet het niet te delen! We have witnessed this type of prejudicial treatment of Zwarte Piet protesters by the media on many occasions. There have been journalists, talk show hosts, radio and TV presenters and entire media-outlets that have shrugged at, laughed off and ridiculed their views, with total disregard of the fact that this only served to convince their audiences that minorities do not have the right to come at Dutch traditions, no matter how offensive they consider these traditions. That the opinions of a relatively small part of Dutch society do not count. By extension, this breeds marginalization, hatred, intolerance and discord. And discrimination – in this case on the basis of skin colour, race and assumed inferiority. The news media should never serve that purpose. It is disconcerting to witness media still becoming weapons of intolerance. Journalists must be aware that ignorance and a lack of appreciation of different cultures, traditions and beliefs within media may lead to stereotypes that can incite racist attitudes. They must also be conscious of the impact of their words and images given the deeply-rooted fears and anxieties of different communities that exist within society. Media executives must eliminate discrimination within journalism and ensure that their platforms do not carry populist or dangerous ideas purely for commercial gain. We should therefore take a stand against these appalling practices. Racist attitudes pose a threat to democracy, the rights of trade union organisations, a free media and racial equality. 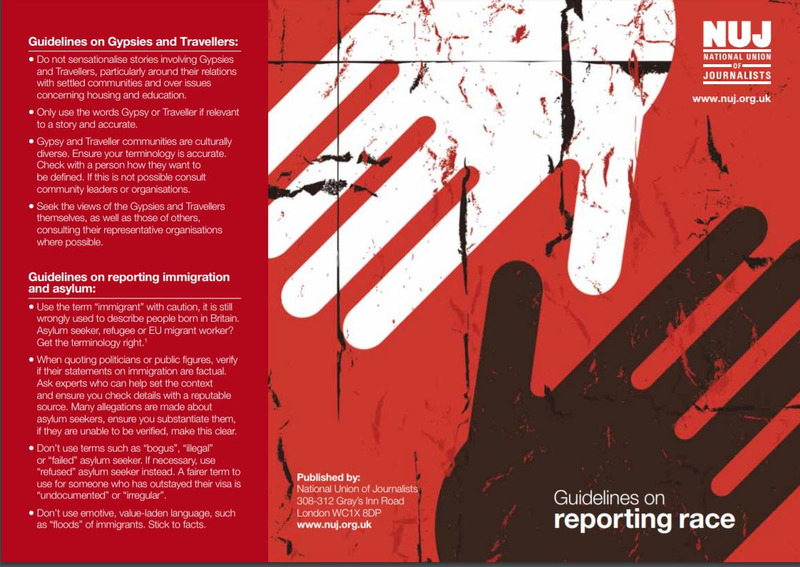 Journalists do not have to report on racist organisations. It is disheartening to have to point out these basic principles in 2018, but now more than ever, in this era where ethical practice in journalism is frequently attacked, we must continue to defend these basic principles of news reporting. It is now more than ever imperative that we maintain the most important principle of journalism -objectivity- and resist the commercially driven draw to subjectivity. 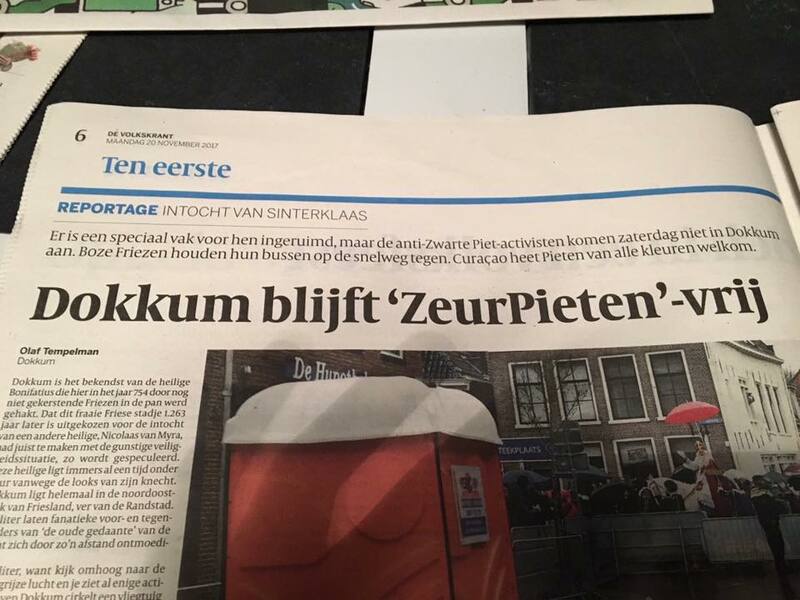 To our brothers and sisters in the Dutch media: we are better than this.